Unless you’ve been blissfully ignorant this past year about the potential health risks involved with e-cigarettes (vaping) you know that they are not good for you. Not only do many of them contain the highly addictive nicotine but the side effects of “vaping” are extensive. Some of those side effects include: nausea, vomiting, stomach pain, eye irritation, high blood pressure, seizures, and even coma. Additionally, the FDA reported that it has discovered cancer-causing substances called nitrosamines. 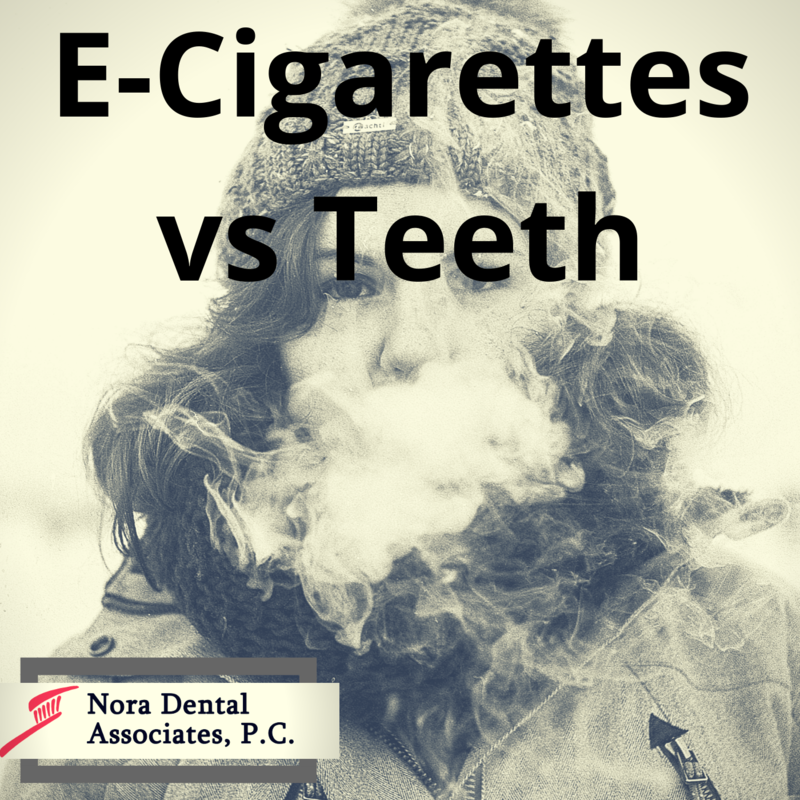 What you may not have known though is that e-cigarettes may very well increase your cavity risk. E-cigarettes work by heating a liquid that contains a plethora of chemicals as well as sweet flavors that contain saccharides and/or acids. These sugars and acids interact with the tooth enamel in a similar fashion as hard candies. There is prolonged exposure of the teeth to these saccharides and acids which work to erode the enamel. E-cigarettes are now the most used tobacco product amongst middle and high schoolers in the U.S. Unfortunately, this is the same population segment that eats the most amount of high sucrose foods as well as the same segment that has the lowest oral hygiene upkeep. The combination of all of these risk factors is a recipe for a cavity filled disaster. I think it’s a safe assumption that most people realize candy is not good for your teeth. Not only can sticky candy remove caps/crowns, fillings, and harm braces, but there is bacteria in your mouth that feeds on the sugar and creates acid that erodes tooth enamel. 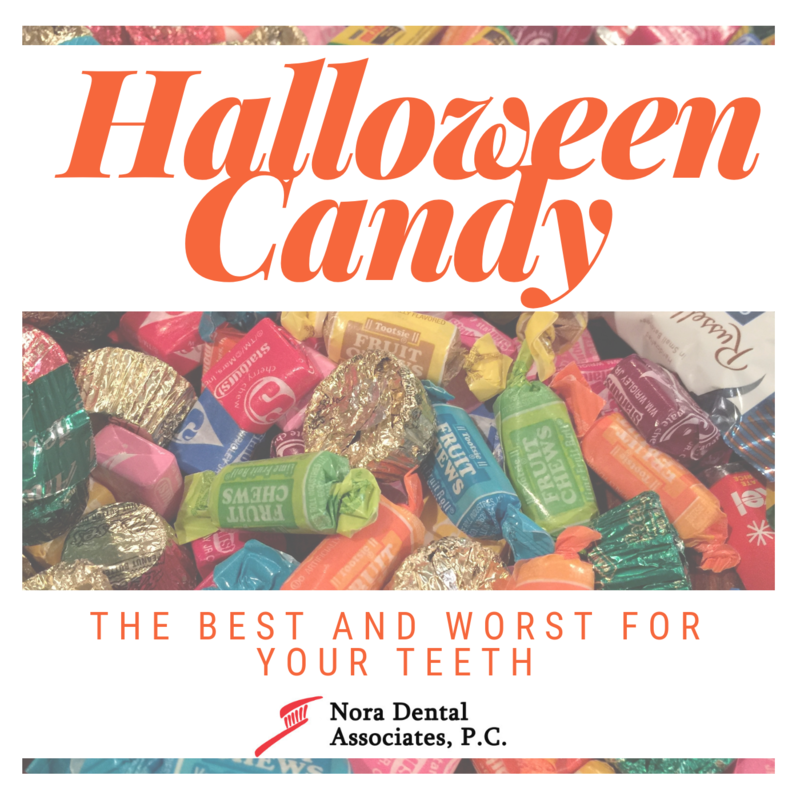 But I also realize that a Halloween without candy is really no Halloween at all so we are going to help determine the best and worst candies for your dental health! Chewy Candy (Airheads, Twizzlers, Taffy, etc) : Besides the obvious sugar aspect, these candies linger longer in your mouth which gives them additional time to cause tooth decay. Sour or Citrus Flavored Candy (Sour Patch Kids, Lemonheads, etc): In addition to being sugary and often times chewy, they contain a high level of acid that eats away at your enamel. Hard Candies (Suckers, Jolly Ranchers, Gobstoppers, etc): The entire purpose of these candies are to be long-lasting but unfortunately that is exactly why they have made our candies to avoid list. The longer these candies are allowed to marinate in your mouth the more damage they can do. Our best advice is that if you or your kids indulge in one of these hard candies to brush your teeth immediately following finishing the candy. Chocolate: Not only are chocolate bars among the nutritionally healthier of candies but they are your best choice for dental health as well. Chocolate tends to wash off of the teeth quicker and easier with your saliva than that of other types of candies which greatly shortens the amount of time the sugars are exposed to your teeth. If you really want to go the extra mile for your teeth and overall health, choose a dark chocolate that contains less sugar or a chocolate covered fruit or nut for additional nutritional health. With all things, the key to dental health (and overall physical health) lies in the key of moderation. We hope you have a fun & healthy Halloween!